The Best Pages & Tunes of March! Home / thinking / books / The Best Pages & Tunes of March! Here’s the Best of March…according to Tripp that is. This March was the month of the eBook! Over the course of the month I have plowed through some awesome eBooks so if you kindle you need to download at least one of these for your brain. Personally I am thrilled about the advent of eBook theology. It is sure to create a market that gets better theology to a wider audience. Bo and I discuss this with Tony Jones in the newest TNT podcast. Now for some eBooks! 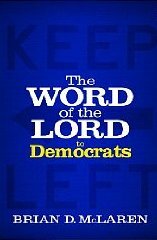 Brian McLaren‘s return to fiction in The Word of the Lord to Democrats ($2.99) is flat out AWESOME. Imagine God getting a new prophet to speak a word to the Democratic party in our present political situation…oh yeah…and God wants the Democrats to stop being wusses and be an actually Left party. That’s what happens. I laughed out loud, said AMEN, & remembered how much I like McLaren’s fictional conversations. James McGrath gives an outstanding introduction to historical criticism and the Gospel in The Burial of Jesus: What Does History Have to Do with Faith? ($2.99) Not only is the book easy to read given the density of the scholarship being presented, McGrath also demonstrates a genuine liberal Christian stance towards critical scholarship and faith. A perfect way to get your foot in New Testament scholarship. Tony Jones discusses the cross in A Better Atonement: Beyond the Depraved Doctrine of Original Sin ($2.99) and Julie Clawson gets cinematic in The Hunger Games and the Gospel: Bread, Circuses, and the Kingdom of God ($4.99). For more on either book just check out our interviews with the authors on the TNT podcast. For something PRACTICAL and USEFUL check out Made to Stick: Why Some Ideas Survive and Others Die by Chip and Dan Heath. These two brothers examine the traits of ideas that stick, those that have impactful staying power. The book is perfect for those who have a stack of learning, a powerful idea, or a real big dream but wonder how best to communicate it for your audience then this book is a must read. It is based on a bunch of social scientific research and full of great examples and stories. So if you are a teacher, preacher, or communicator of any kind this book is worth checking out. For something PHILOSOPHICAL that is a nerd’s personal LIBRARY NECESSITY click over to Anthony Kenny’s A New History of Western Philosophy. It is the newest history of philosophy and after a couple interactions with it I have put it on the same shelf as W.T.Jones and Frederick Copleston…which is a big deal compliment. Kenny is not only a world famous philosopher but he is also a Knight…a real one via the Queen. I bought the four volumes put in this single volume as they came out. I love them. They give a summary of the period of history where the big figures and movements are discussed. Then the second half covers the major topics and their development. Get it and nerd out. For something BIBLICAL and PHILOSOPHICAL get on to Keith Ward‘s newest book The Philosopher and the Gospels: Jesus Through the Lens of Philosophy. I love Keith Ward. In this super sweet book Keith gets all philosophical on the Gospels. If you are interested in what Open Theism would sound like if you got to open theism via idealist philosophy and conversations with science then this is it. Best album of the year thus far…Ben Kweller’s Go Fly A Kite. This is a real deal Rock & Roll record. Amazing melodies, great arrangements, and Ben’s perfect pop sensibilities shine throughout. The album covers a bunch of emotions, tells some awesome stories, and keeps you humming all day long. Most anticipated album in my world…Counting Crows’ Underwater Sunshine (or What We Did On Our Summer Vacation). This is the Counting Crows’ first indie release and on April 10th you can expect me to go old school and purchase the physical CD and listen to it repeatedly while smoking a fine cigar. The most exciting thing about this album is the Crows are finally recording all the cover songs uber-fans like me have enjoyed live and never had on our iPods. When the Crows cover a song they don’t just play it, they retell it and often they own it. And if the album wasn’t enough on April 17th Alecia and I will be seeing them LIVE here in LA. It shall be amazing!